When we draw a picture of an object on paper, it has two dimensions, one in X axis and second in Y axis. In this picture you do not get the details about the depth ie Z axis. We can also draw this picture with a tilt and one can get the idea of the depth also. Still you will not be able to hold this object in your hand and see all the details in 360 degrees, in all the three axis viz X , Y and Z. This limitation is overcome by 3 Dimensional printing, and you can hold the object in your hand. This CAD CAM technology was introduced to Jewellers in late 1990 and first machine was installed in SEEPZ - Mumbai. As usual in initial stages, there was resistance to acknowledge and accept a new technology, but within next five years, it was firmly in place and now it is not possible for Jewellers, to live without CAD & CAM services, to manufacture jewellery profitably. Jewelers are using this technology to make accurate Master Models and then use this Masters to make multiple copies and execute their order. With this method jewelers can maintain the weight of precious metal accurately, and avoid rejections from overseas clients. In last 15 years many CAD software are available in market to design a complicated jewellery and similarly many CAM machines are introduced which are giving out puts in wax and Photo Polymer Resin. These resins are castable just like wax OR can be used for making Hot Rubber Molds. Now these CAM machines are more accurate, faster and economical to acquire. Today in India there are around 250 jewelers are using CAM machines in house and another 30 service bureaus, providing CAD and CAM services in India. These service bureaus are the main engine to make this CAD CAM technology available to even a small time jewelers, at a very reasonable charges. Sarto Electro Equipments Pvt. Ltd. is Distributor of M/s. EnvisionTEC GmbH, which is leading 3 D Resin Printing machine manufacturer from Germany. EnvisionTEC is using DLP technology and Photo Polymer Resin to make 3 D models layer by layer. We have five models to choose from, depending upon your technical and commercial requirements. We also would like to add that this is not the end of 3 D model making technology. In the horizon Another Technology has arrived now and that is known as 3 D Metal Printing Machine, where in a fine metal powder is melted with Laser Beam, layer by layer and your Jewellery is produced. This technology is developed by M/s. Concept Laser GmbH, who are the leader in laser and metal cusing technology. Sarto Electro Equipments Pvt. Ltd. is Distributor of M/s. 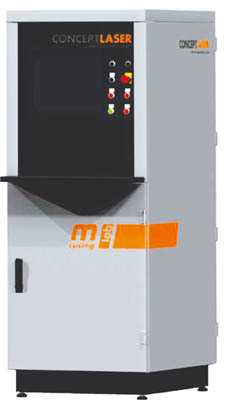 Concept Laser GmbH, which is leading 3 D Metal Printing machine manufacturer from Germany. The output is directly in 18 Kt Gold. When you use this machine, you will eliminate five major process including Burnout & Casting. Presently we have Gold powder in Yellow, White, Pink and Red, from Hilderbrand of Switzerland and Legor from Italy is making 18 Kt. Yellow Gold Powder.